For those who lack a sweet tooth, get them one of our premium Savoury Hampers. With simply stunning gourmet brands exclusive to The Hamper Emporium hamper range, you won't find better hampers anywhere else! 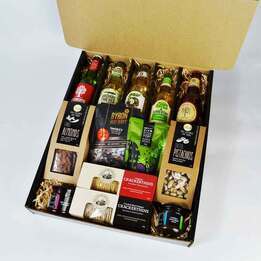 Enjoy savoury delights and moreish nibbles with these premium savoury hampers. Get yourself something down-to-earth and delicious. Treat yourself with one of our wonderfully Savoury Hampers. The Entertainer Gourmet Hamper is always a classic choice. Spice up your Barbeque with the Premium BBQ Australia Hamper. Pick a nice day and go out to the park, don’t forget to bring along the Spring Picnic Hamper. For all your Savoury Hamper needs, Everything But Flowers can provide. Looking for presents for a cooking enthusiast, a BBQ lover, a wine and beer connoisseur or perhaps a home entertainer? Look no further because for every mum or dad out there who loves to get hot in the kitchen, there is a savoury hamper perfect for him or her! Get savoury hampers as a present for your favourite foodie and we assure you that this will be his/her favourite gift! 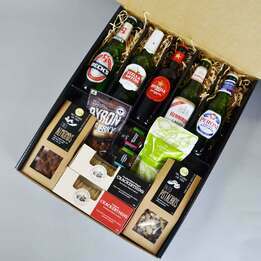 Savoury hampers as a present is sure to turn up your gift-giving skills to a whole new level. Everyone loves hampers, and everyone loves savoury food and entertainment; and with all-time favourites filling in a hamper basket, your gift is sure to be a big hit! Hampers as a present can be really personal and this is why it’s one of the bestselling items in any gift store. Choose a hamper that will satisfy your gift receiver’s hobbies and interest and we assure you that he or she will love it. Hampers are available in a variety of choices, from kids hampers that are filled with bath towels and educational toys, to men’s hampers that include vanity items like premium shaving creams and blades, to pamper hampers that assure gift-receivers the ultimate relaxation they deserve. There are people who love the sweet things in life, and there are people who like the savoury things in life. We have come up with a list of our favourite savoury pampers as a present to help you spice up you presents. This luxurious savoury hamper contains gourmet favourites from around the world. For the savoury treats, you have hazelnut & pork terrines, a Paris green olive spread with fennel, and savoury crackers and biscuits, and a truffle and mushroom salsa. For the alcohol, this hamper includes a Glenmorangie Original Scotch Whisky. This great BBQ hamper contains premium marinades, rubs, and a bottle of wine perfect for chilling under sun during picnics. This savoury hamper includes a 100% Australia Beef jerky, premium nibbles and crackers. For the BBQ, it includes a sweet fire balsamic reduction, a hand smoked jam, a spice rub, and a steak % BBQ grinder. And lastly, for the alcohol, this savoury hamper comes with a 2012 Pepperjack Shiraz by Saltram of the Barossa. For the self-proclaimed foodies, this savoury hamper has everything from cheese, crackers, and wine. Indulge in a bottle of Pinot Noir, in various preserves perfect for gourmet crackers and biscuits all laid out in the Bamboo Cheese Board included in this savoury hamper. Get savoury hampers as a present and other hamper choices only here at Everything But Flowers. When it comes to buying hampers, Everything But Flowers is one of the best online stores in all of Australia. For other gift choices for Christmas, Birthdays, Valentine’s Day, Mother’s Day and Father’s Day, check out our widest collection of gift ideas. Don’t wait any further to treat your loved ones. Get a gift from Everything But Flowers today!